Categories: Mahans, Sri Chandrasekharendra Saraswati Swamiji, Sri Muralidhara Swamiji. The Vedas are the basis of our Sanatana Dharma. It is the blueprint of the entire universe. It is the Word of God. The Vedas were originally absorbed and given to the world by great rishis. Since then, they have been passed down from generation to generation from a Guru to his disciples and so on, for millions of years. The constant chanting and study of Vedas is very important for the sustenance of dharma in this world. But now and then, due to Time, the Vedas disappear from the view of the world. And always there are Mahatmas who strive to revive Vedic knowledge and reinstate it in its exalted position. HH Sri Sri Muralidhara Swamiji would always speak of Sri Kanchi Mahaperiyava as one such mahatma in recent times whose revived and protected the Vedas, which had almost disappeared at the time. Sri Sri Muralidhara Swamiji also strives to protect and grow the tree of Vedas by emphasizing the importance of the Vedas and encouraging students to take up its study, establishing Veda patashalas, conducting conferences (sadas) where Vedic scholars from all across the country come together to chant the Vedas and learn from each other, and more. In the article below, Dr. Bhagyanathanji speaks of one such Vedic event that was held recently in Bengaluru. Our Sandeepani Gurukula patashalas are operating in Madhurapuri Ashram, Srirangam, Hyderabad, Gurgaon, Senganur and in many other places. A Vaishnava Agama patashala is operating in Nangur. More than 100 vidyarthis (students) do adhyayana (study/chant) of Rig, Yajur, Sama and Prabandham in these centers. Among these, due to the efforts of Sri Brahamanand, Sri Sri Muralidhara Swamiji Kainkarya Sabha was established by Veda vidyarthis who graduated from these centers and other Vedic scholars. Under the auspices of this Sabha, Veda parayana and satsangs are often conducted in many places. Sri Anand and Sri Vedaram, who completed adhyayana in our patashala, and Sri Santosh are its trustees. Through this Sabha, on the occasion of Sri Swamiji’s star (tirunakshatra), Yajur Veda Samhitha Parayan took place in 2015 in Ayodhya Ashwamedha mandap, Chennai, for the first time. The second event to happen under the auspices of this Sabha was during the auspicious time of Mahamaga when Rig Veda Parayan, Yajur Veda Moola, Krama, Gana, Sama Veda Parayana and Prabandha took place from Feb 12-22, 2016 in Sastra University, Kumbakonam. 67 Vedic vidwans (scholars) participated in this event. The third event was an Akila Bharatha Sama Veda Sammelan from July 20-29, 2016 in the Seetharama hall of Sri Sundara Anjaneyaswami temple in Bengaluru. 27 Sama Veda scholars did Ashtabrahmanandam Parayan in this event. On the occasion of Sri Swamiji’s star, satsangs took place from Oct 25-31, 2016 in Ayodhya mandap, Chennai. Yajur Veda Jada Parayan was also held from Apr 15-19, 2017 in Brahma desa. Recently in Kalkere, Bengaluru, at the premises of Sri Sundara Anjaneya temple, in the Seetharama hall, 48 Veda scholars did Rig Veda Gana Parayan completely for seven days, from July 16-22, 2017. This took place under the supervision of an adhyapak (teacher) of Sri Sandeepani Gurukula, Brahmashri Udhaneswarabhat Ganapatigal. Brahmashri Shridhar Ganapatigal was very helpful for the preparations for the Rig Veda Parayan. Rig Veda is classified into 8 parts. Parayan was done by splitting one ashtaka for six and making eight groups. On the day of completion, Brahmashri Venugopala Ganapatigal was awarded the title “Rig VedAcchAriya:”. He has trained many Rig Veda Ganapatigals. He has done parayana of all the eight 8 Vikruthis. Brahmashri Surya Narayana Ganapatigal was given the title “Rig Veda Raja”. Normally, certain questions will be asked during the Vedic exams. When answered, the candidate will be informed whether it’s right or wrong. But, in Maharashtra, when giving a Veda exam, one has to sit on a stage alone and chant the Gana of the whole Rig Veda without seeing. The scholars who are seated down would be watching the book keenly ensuring that there are no errors. In Satara, Maharashtra, Brahmashri Surya Narayana Ganapatigal gave this Rig Veda Gana exam for 41 days and got this title. People from Maharashtra took him for procession on an elephant (Gaja Arohanam). Here in Bengaluru, Sri Swamiji took the Ganapatigal and his peers for procession on a horse (Ashva Arohanam). Brahmashri Manikandan Ganapatigal who took part in the parayana, after completing Rig Veda Gana, studied Vyakarana Maha Bhashya and gave an exam for that in Tenali. Brahmashri Kumara Ganapatigal, after completing Rig Veda Gana, did complete adhyayana of Rig Veda Bhashya. Brahmashri Radhakrishna Ganapatigal completed Rig Veda Gana adhyayana and subsequently went on to complete the adhyayana of Shadangam Salakshanam (Dashagrantham) completely. Brahmashri Raghavendra Ganapatigal, Brahmashri Gautam Ganapatigal, Brahmashri Ishwara Subramanya Ganapatigal, Brahmashri Shriram Ganapatigal and Brahmashri Krishnan Ganapatigal have completed Rig Veda Gana and done adhyayana of Sama Veda Jaimini saakai and Atharvana Veda. Brahmashri Chandrakant Ganapatigal completed Rig Veda Gana and also has done adhyayana of Krishna Yajur Veda. Brahmashri Sivasubramanya Ganapatigal completed Rig Veda Gana and went on to do adhyayana of Kavya and Gaumuthi (Siddanta Gaumuthi). Special honors were made to the above mentioned scholars. During the Rig Veda parayana, ‘Kal vaittha varam‘ competition took place. Here Vedic scholars and students participated with enthusiasm and bagged prizes. Bhagavata Dharma and Vaidheeka Dharma are like our two eyes. In Bhagavata Dharma, it is a standard practice to worship the feet (pada pooja) of the bhagavatas who do Namasankirtan or those who do Uncchavarthi. Likewise, respects were offered to the Vedic scholars who did Rig Veda Gana Parayana; Pada pooja was done to them, they were adorned with crowns on the head, were offered garlands and offerings were given on behalf of Kainkarya sabha by placing them on the head. 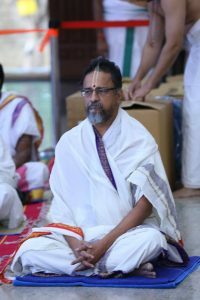 Apart from this, on behalf of Dr Yegnasubramanian’s Om Foundation, Sri Sethuraman took part and honored each vaidheeka with 10,000 rupees (sambavanai). Sri Sankaranarayanan from Bengaluru made preparations and took care of the necessities of the Vedic scholars in a special manner. The devotees who had come to take part also did whatever service they could do to the vidwans. Gana Parayana thus took place in a grand manner. Sri Sri Anna (Sri Krishnapremi Swamigal) visited Sri Sundara Anjaneyai temple on July 17 around 8:30 in the morning. He took part in the Gana parayana and gave his anugraha bhashanam (blessing message) which was the crown jewel of the event and made it special. Sri Sri Anna blessed gold coins to all the Vedic scholars personally with his divine hands.